RESTON, Va., Oct. 31, 2017 /PRNewswire/ -- RockDove Solutions Inc. has announced a series of important enhancements to its award-winning 'In Case of Crisis' digital crisis management solution – bringing nearer the end of the persistent practice of storing crisis plans in ring-bound folders on dusty shelves, making the plan inaccessible when the worst happens. Increasingly, mobile devices are the digital tools to effectively manage, access and activate crisis management resources to match the speed at which issues emerge and develop, often driven by social media. There are an estimated 200 million smartphone users in the US alone. Company intranet sites that are difficult to use, or even access, from off-site locations and which offer little functionality to activate the crisis team, have not proven to be viable options. RockDove reports a 950% growth in business in the past three years, driven in part by organizations' increasing uncertainties from the collision of business, political, cultural and social issues and the ever greater need to respond quickly when a threat emerges. RockDove's market-leading 'In Case of Crisis' digital crisis management solution is already in use by more than 750 organizations. Stronger security - serves as a cornerstone of the platform and subject to constant improvements, including compliance with tightened Apple requirements and the ability for organizations to set their own expiration date for passwords and end-to-end encryption. Single sign-on – streamlines the adoption process in allowing users to log-in with their business credentials used for apps and other software. Polling functionality – collects feedback and current work status from all users as the threat evolves in real time. Support for Windows – enables access to an organization's plans on any platform running Windows 10 or more. ContactSync – connects to client HR and active directory systems to ensure contact information is up-to-date in the event of a crisis. 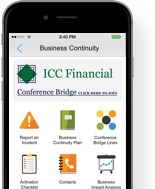 Quick contacts shortcut – displays custom icon linking to phone numbers and contacts that users most need in a crisis. Newly re-designed user interface – creates a cleaner look, improved menu bars and better design consistency. Enhanced Editing Toolbar – improves the administrator's ability to copy and paste from outside software to build information, reports and forms. "The ring-bound binder was invented in Germany by a gentleman called Friedrich Soenneken in 1886. Even Friedrichwould be surprised that his idea is still preferred in 2017 when we otherwise use our mobile phone to do so many activities, from ordering food and taxis to managing our banking. "We believe that the addition of so many new features and enhanced security to 'In Case of Crisis' will accelerate the adoption of digital crisis defenses to match the technology-driven threats faced by organizations in an increasingly uncertain world."